Microsoft Office Business Premium � Gain cloud access to all the core Microsoft apps included in the Microsoft Office 365 Business Premium suite including Skype for Business, OneDrive and much more! Free conversion from QuickBooks® and Quicken®3. Get automatic Sage 50c software updates and product enhancements with your current monthly or annual subscription3. These benefits and more are included with your purchase of Sage 50c Pro Accounting 2018 which comes with an auto-renewing Sage Business Care plan! Small business owners play many roles. For most, the roles of accountant or bookkeeper are the least favorite roles to play. The best accounting software doesn't just help with bookkeeping - it helps you get organized and simplifies bookkeeping. Sage 50c Pro Accounting does that. It gives you the information you need to make more informed, more financially sound decisions - better decisions. Sage 50c Business Intelligence does that. 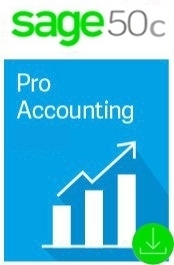 Save time, money, and run your business better with Sage 50c Pro Accounting.